Strangles is a serious and highly contagious respiratory disease of horses. It is caused by the bacterium Streptococcus equi subspecies equi and is found worldwide. In classic uncomplicated strangles horses usually recover uneventfully within a few weeks, but it can be fatal for some horses. Recovered horses commonly shed bacteria in respiratory secretions for up to six weeks and a small percentage may become carriers for years without any outward signs. Antibiotic therapy for strangles is controversial but likely to be most useful very early in the disease process. This should be decided by your veterinarian and is considered on a case-by-case basis. If severe swelling of the abcessed lymph nodes has occurred it may be necessary to lance them to aid breathing. Nursing care such as warm compresses to encourage bursting of the abscess may be advisable. 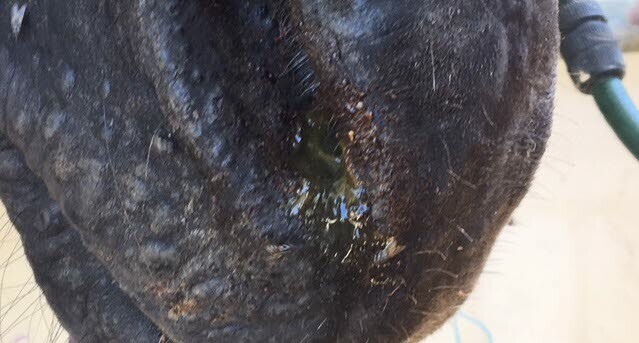 The prognosis for most horses following strangles is very good, but some post infection complications can occur, such as inflammation of the heart muscle, anaemia, guttural pouch infection, or permanent airway problems. Horses should be isolated for 8 weeks after cessation of clinical signs, and ideally at the end of this time have samples taken to ensure they are not carriers of the disease. Photos courtesy of Dr Clare Williams-Paterson.